Base Size: 4.5" x 2.5"
This clever top piece hairpiece is perfect to add on coverage to fine or thinning hair. Versatile 100% human hair with a monofilament base for endless styling options. The appearance of hair growth from a natural looking scalp offers multi-directional looks for confident wear. My hair has thinned on the top area of my head. I have used these hairpieces for the last several years. They are so natural looking no one would know it's not yours. They are very easy to put on and my hair is so easy to fix now. I have wore hairpiecs for three years. My hair lose badly due to cancer. I used to be very afraid of participating in activities. Ever since I wore hairpieces,I'm not afraid to go out anymore. It's the best thing ever! If your hair has thinned out on the top this is the hairpiece you want! When I opened the box, I put the hair piece on my head. It looked very natural and soft to the touch. I purchased several hairpieces in the last couple of years and this hairpiece is my favorite! It's has just the right thickness and coverage for me. 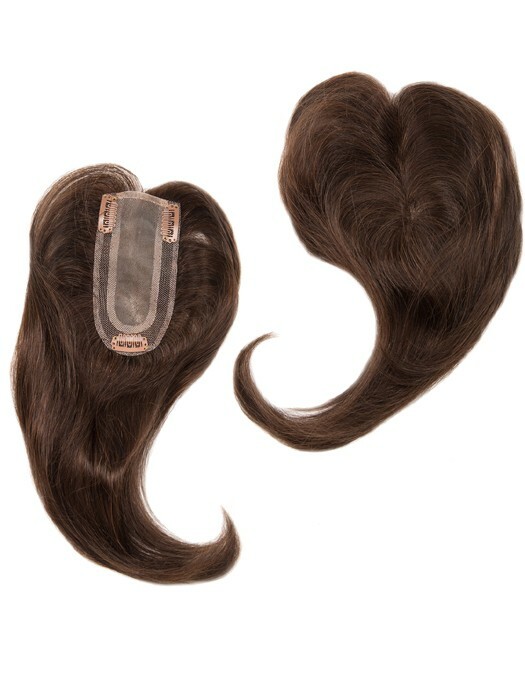 I love this hair pieces and the hair is so silky and nice no one can ever tell it is not my own hair! :)). Loved the topper - it was not heavy - easy to put on and looked totally natural. It is not meant to be a thick wig, instead it adds volume and is real hair that never sees a bad day. Thank you so much for a beautiful 12"Human Hair Topper (Mono Top).This topper is so light and airy that it doesn't even effect me walking in the sun here in Texas! And the color is phenomenal. I wear it all the time and will never part with it. It is awesome! I love it. I would like to purchase another one please but I would like my new one to be human hair also but wavy, a little curly but not too curly at the bottom.